About 16,000 houses in England were flooded during the wettest December in a century, Environment Secretary Elizabeth Truss has told MPs. 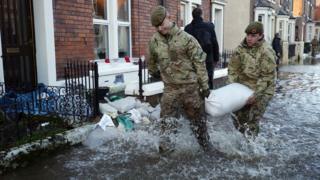 Defending the government's response to the crisis, she said flood defences had protected more than 20,000 homes. Financial aid was provided in "record time", and there are plans to further improve flood defences, Ms Truss added. But Labour accused ministers of not spending enough on defences, calling measures a "sticking plaster response". What have we done to make the flooding worse? Making a statement in the Commons, Ms Truss said record rainfall meant meant rivers in Lancashire rose to some of the highest levels ever seen, while Yorkshire rivers like the Aire and the Wharfe were up to a metre higher than previous records. "This resulted in the flooding of about 9,000 properties, which together with the earlier flooding in Cumbria brings the total to around 16,000 flooded properties in England," she said. "Whilst of little consolation to those who have been flooded, it's important to note that flood defences have protected over 20,000 properties." 30 December: Storm Frank hits, with Scotland and parts of northern England worst affected by fresh flooding. 4 January: Heavy rain in Scotland causes yet more flooding, particularly in the North East. Residents are evacuated and some roads collapse. She added the government will continue to do "what it takes" to get the affected areas "up and running". This included making repairs to Tadcaster Bridge in North Yorkshire - which collapsed in the severe floods - a "national priority", she said. The town is now split in two, with residents having to take a 10 mile detour to get from one side to the other. It is estimated repairs will cost £3m and could take a year to complete. Ms Truss said a plan for the bridge's repair would be in place by early next week, and that funding would then be provided "promptly". The National Flood Resilience Review, which aims to improve protection, will "ensure the Leeds scheme would cope with the new levels of rainfall we're now seeing", she added. However, shadow environment secretary Kerry McCarthy said the government "chose to ignore warnings" that an increasing number of homes were at risk of flooding. Ms McCarthy questioned whether the government's £2.3bn capital budget over six years for flood defences was enough "given the government has underestimated the climate change risk". "Rather than a sticking plaster response every time the floods hit with vague promises and random numbers that are forgotten by spring, we need a long-term co-ordinated approach. Ms Truss said the government had learnt lessons from previous floods, and said the response to the recent flooding had been swift and effective. She criticised the previous Labour administration's approach to flood defence spending and insisted a long-term plan is now in place.